On Nov 13, 47-year-old Tang Fuzhen shocked the nation by setting herself ablaze in an act of protest against the demolition of her former husband's garment processing unit in Chengdu, capital of southwestern Sichuan province. Days later, the severely burned Tang succumbed to her injuries at a city hospital. The act, while not an isolated instance of such an extreme form of protest against "forced demolitions", nevertheless left the nation in a daze. Relatives and residents of Jinhua village in Chengdu's Jinniu district, where her ex-husband Hu Changming's 2,000-sq m building was located, have poured scorn on the local government for its inept handling of the issue. Angry netizens too joined in, criticizing the local authorities for the violent way in which the law was enforced, even as the local government insisted it was only doing its job. The uproar has yet to die down, and the incident has triggered a debate of sorts on the "forced demolitions" that are rampant across the nation. Xiao Rong, a middle-aged government employee in Jinniu, is one such concerned citizen who has been following the tragic development ever since it happened. "It is not just because it happened in my district, but because similar incidents have taken place across the country in recent years," Xiao told China Daily. 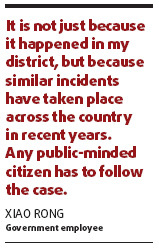 "Any public-minded citizen has to follow the case." The tragic tale has its genesis in 1996 when local authorities tried wooing investors to develop its economy. It was then that Hu signed an agreement to rent land, after paying 40,000 yuan ($5,880), for his planned three-story garment processing plant in the village. Hu's troubles started in August 2007 when the district government decided to link two roads in order to lay underground pipelines for a sewage treatment plant in the city. Hu's building, unfortunately, stood in the way of the road project. When the district's urban management and law enforcement bureau started negotiating with him (19 times, according to the bureau) to compensate for the demolition, Hu asked for at least 8 million yuan ($1.17 million), the bureau officials said. The department, however, believed that the construction cost of each sq m of the building had not crossed 1,000 yuan when it was built, said Zhong Changlin, the bureau's chief. After repeated negotiations failed, the bureau decided to forcibly dismantle the building, labeling it illegal on the grounds that Hu did not possess a construction permit and that he had failed to obtain proper land use papers from relevant government departments. The bureau's first demolition attempt was foiled in April this year when Tang, whom Hu had divorced in 2004, threatened suicide. In the wee hours of the morning of Nov 13, however, Zhong and his men arrived again to demolish the building. But Tang, together with her relatives and those of her ex-husband's, threw rocks and bottles filled with gasoline at them, injuring at least 10 of his squad, Zhong said later. Nearly three hours into the melee, Tang, who had poured gasoline all over her body, set fire to herself. The building was dismantled despite the violent suicide. Eight members of Tang's and her ex-husband's family were detained. District officials soon blamed them for "violently blocking the enforcement of law", a charge that they announced at a press conference held last Thursday in the city. On the contrary, witnesses say, the fully armed demolition squad was the one that violently went about its demolition task. 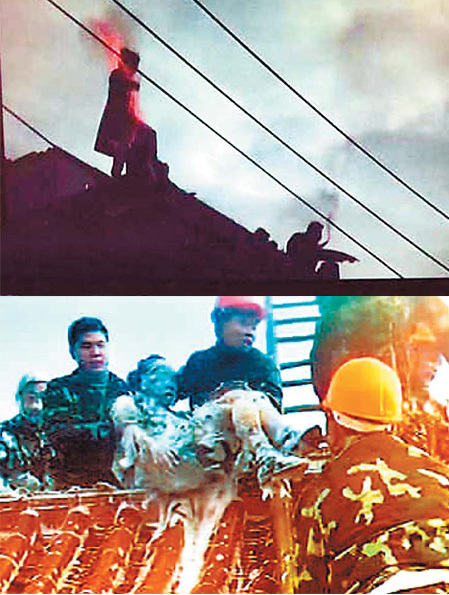 Top: Tang Fuzhen is seen setting fire to herself in this TV screen grab. (Above): She is carried down from the roof and taken to hospital where she subsequently succumbed to her injuries. China will launch its second moon orbiter next October, state media reported today, as it powers ahead with a space programme that has sparked concerns abroad.